The idea of making a video project to carry the magic of anime in reality hovers at least since 2006, but the spark which set off the creative process of CENSORS was the publication, on May 8, 2014, of the video “ONE PIECE Ultime notizie !! !” on YouTube, where the voice actress Emanuela Pacotto announced the release of new episodes of One Piece, to answer the thousands of questions she still receives from fans. This video, which surpassed the 50.000 views in the first few days between YouTube and Facebook, was followed by a “viral" joke channeled through a post on Facebook which announced the “mysterious disappearance" of the voice actress. That day, between 5pm and 8pm, the post surpassed 30.000 views and, to appease the souls of the fans (who were) in an uproar, a video of a “fake newscast” was released in which Emanuela herself, enacting multiple characters, revealed the truth about her alleged disappearance. From all of that the title "CENSORS" emerged which was followed by the first trailer released on June 23, 2014, exactly three months before the draft of the script. The idea of this project was so clear in the mind of writer/director Max Coltorti, that the shooting begun without a script. The final scene of the diving was filmed in Sardinia one month before the writing of the script, at the end of August 2014. The main script was completed on September 25, 2014 and was amended nine times until April 14 2015 also to mold ideas and situations based on facts and trends occurred during the long making of the film. Some of the clothes and accessories were purchased during the last years by Emanuela herself, who loves to collect special items saying “it could be useful sooner or later” (truer words have never been spoken) (and assembled and customized by her according to the needs.). Accessories and clothes were assembled and adapted as needed by Emanuela herself. Since (the production) couldn’t rely on sponsors and had a limited budget, it had to face challenging working sessions both to shoot scenes and to post-product them, these were the reasons why the producer, Max Coltorti (BABYLON/AMBITION), had to write the script, deal with the direction, do most of the shooting, do the editing, compose the soundtrack, create the foleys, follow the field recording and produce the first draft of the visual effects later implemented by Davide Famoso (Visual FX Artist - LineaContinua). The film shooting equipment for CENSORS consisted of: Canon 7D, Canon 7D Mark II, Sony FS700, Sony FS100, Sony AS100, Microsoft Lumia 925, obiettivi Zeiss DISTAGON T* 21-28-35-85mm, Zeiss Compact Prime CP.2 Super Speed 35mm, Canon 17-55mm IS USM, microfoni Rode Video MIC Pro, Rode NT-USB1. On December 7, 2014, (production) had to stop for more than a month after a severe “technical mourning”. During a session of shooting on location, the glorious Canon 7D, dropping inexplicably from the stand, fell and broke on the asphalt. 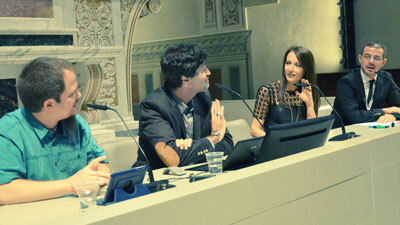 Great success for the world premiere of CENSORS, the first "Anime Live Action" Web Movie entirely made in Italy. Sunday November 1st in Auditorium San Francesco the star Emanuela Pacotto with the production team attended the premiere along with a large audience. After the screening there was the conference, where Emanuela, the director/producer Max Coltorti and the visual effects supervisor Davide Famoso revealed interesting details and backstage of this innovative project. "I was fascinated by both the protagonist and CENSORS' plot, that sums up this year's spirit of Lucca Comics -Sì Viaggiare-. You can travel to different regions and cultures, but you can also travel by turning off the light, like in the movie, and then start with your dream." "CENSORS is the synthesis of all our lived experiences among anime and manga, Japanese culture and, especially, the constant contact with enthusiasts and fans, who always are very aware of these issues on social networks." "We have not succumbed to the temptation to imitate videos like the ones already offered on the net, because we did not want to copy other formats or make yet another fan movie and we did not want to use rude language. We preferred to wait and look for an idea suited to the way we are, and then it was CENSORS"
"The length of CENSORS was cause of many thoughts for us. We wanted to tell a story with a movie's narrative structure but we were aware that users attention decays very rapidly on the net. In our opinion 15 minutes was the right length and that is why we chose the definition of WEB MOVIE to identify this new type of video"
"When dealing with genres that are different from your own you have to do it with great respect and you have to gather informations to understand the nuances of cultures different from your own. Then you have to mix everything with your experiences in order to reach the final mix which should have its own identity." "We deliberately chose to create visual effects which recall those found in the cartoons of the '80s to recreate a visual experience closer to that of our memories"
Is it the dawn of a new genre? Only time will tell.